It’s unusual to find a handyman or an outdoorsman today who doesn’t carry some sort of multi-tool, but not too many years ago the multi-tool was only an idea in Tim Leatherman’s mind. There’s plenty of competition for the best in the industry today, even if your own company made the first one. 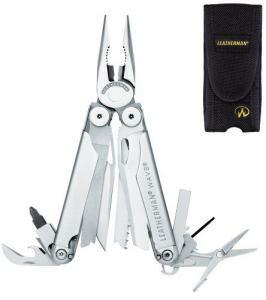 Leatherman multi-tools are still top-of-the-line, constantly offering new features and handy improvements. The older models don’t go out of style, and were built to last. The Leatherman multi-tool concept evolved from a challenging vacation Tim Leatherman and his wife took in Europe in 1975. Armed only with a boy scout pocket knife, Tim took on an uncooperative Fiat and faulty plumbing in quaint continental hotels, coming home with a list of problems for his mechanical engineering education to tackle. With the help of family he advanced from cardboard multi-tool models to a working prototype called “Mr. Crunch,” which debuted production in 1980 and earned the praise of the New York Times. Aside from that, the new tool drew little attention. In 1983 small lots of an improved version, the “Pocket Survival Tool,” were purchased by Cabela’s and Early Winters and featured in their Christmas catalogs. Sales jumped to 30,000 pieces the next year, almost eight times the manufacturer’s best hopes. 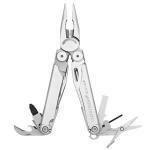 Annual sales reached a million pieces in 1993, the year a Leatherman multi-tool appeared in the “MacGyver” TV series. Leatherman tools played roles in “Speed” in 1994; in “Rush Hour” in 1998; and in “The X-Files” in 1999. By that time the Leatherman multi-tool was entrenched in pockets and attached to belts all over the U.S. Leatherman expanded the product line to folding knives, hunting knives, and flashlights after 2005 and continues to produce more and better multi-tools. You’ll find a Leatherman multi-tool for nearly every specialty, and even the specialty multi-tools fit a variety of unexpected situations. 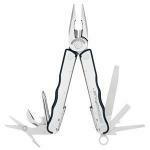 Leatherman builds multi-tools designed for gardeners, hikers, and fishermen, as well as mechanics and carpenters. If your professional needs include Explosive Ordinance Disposal or firearms maintenance, Leatherman also makes tactical versions for police and military applications. The Leatherman Wave offers one-handed opening of the main knife blade, without unfolding the tool; and the Leatherman Squirt presents knife, scissors, pliers and essential tools in a package small enough to serve as a handy keychain. Leatherman’s folding knives don’t give up the multi-tool concept — many feature a screwdriver bit as well as a stout knife blade. 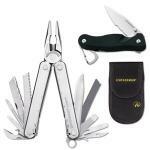 Leatherman offers two of their best tools in this combination set. The Core Multi-tool still ranks as the most rugged Leatherman Multi-tool made, and the lightweight Crater C33LX pocket clip folding knife offers two one-handed opening options. 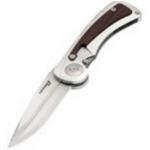 One of Leatherman's larger folding knives for the outdoorsman, the Leatherman E55 Expanse takes basic concepts introduced in the Leatherman Crater knife and improves on them. The several models of the Expanse offer choices of edge type and a bit driver blade option. One of the most sensible improvements to any multitool is a separate knife to use instead of the awkward pen-knife blade that's the usual multitool fold-out option. That's what Leatherman offers in the Core Multitool and C33LX pocket folder combo. 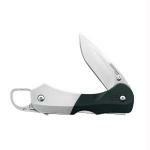 Something you won't find in many folding clip knives is a built-in carabiner clip. The Leatherman C303 has it, plus a couple of tricks you wouldn't expect even from a company that makes multi-tools. Well, the folks at Portland, Oregon, based Leatherman have done it again. This time with a 3-in-1 fixed blade knife, bone saw, and gut hook - perfect for field dressing in a really ingenious design. The Leatherman Micra is basically a miniaturized version of the Wave, with a few tools left out of the mix since it's smaller. Leatherman included all the basics, though, and made it small enough to have on your key chain so it would be easier to carry around. Leatherman makes gardening tools? Who knew? Makes a lot of sense though. When you're out in the garden pruning, it sure is nice to have a set of other various tools with you for miscellaneous tasks. I have to admit -- I'm not a big fan of "New Wave" music. There's something so 80's about it, I'd just soon leave it behind. What's that? This is a Leatherman New Wave? Oh, that I can get behind! 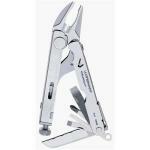 Leatherman delivers a mid-sized multi-tool in their Juice CS4 model. Leatherman has quite a following and you'll see endless debates about how their products stack up against Swiss Army Knives. Truth is that both Victorinox and Leatherman make good quality products, and the CS4 is no exception. These new Leatherman designs have quite the space-age look to them. Those holes, though, are to keep the weight down while not sacrificing strength. This multitool features eight separate implements (ranging from pliers to a bottle opener) in a single tool weighing five ounces. This is a neat little multi-tool from Leatherman. It's not packed with features like some other knives, so make sure it's got everything you need before purchasing. 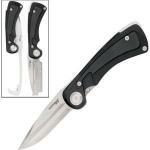 It does come with several useful features in addition to the 3-inch partially-serrated knife blade itself. 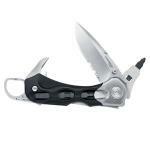 Leatherman presents the Wave Nylon Sheath knife / multi-tool. As you've come to expect with Leatherman products, the Wave is much more than simply a pocket knife. It includes a large variety of quality tools to suit any situation. It unfolds to reveal needle-nose/regular pliers, wire cutters, and a wire stripper.